Mixing military and futuristic sneaker design cues. Yesterday Fear of God shared the official lookbook for its sixth collection. 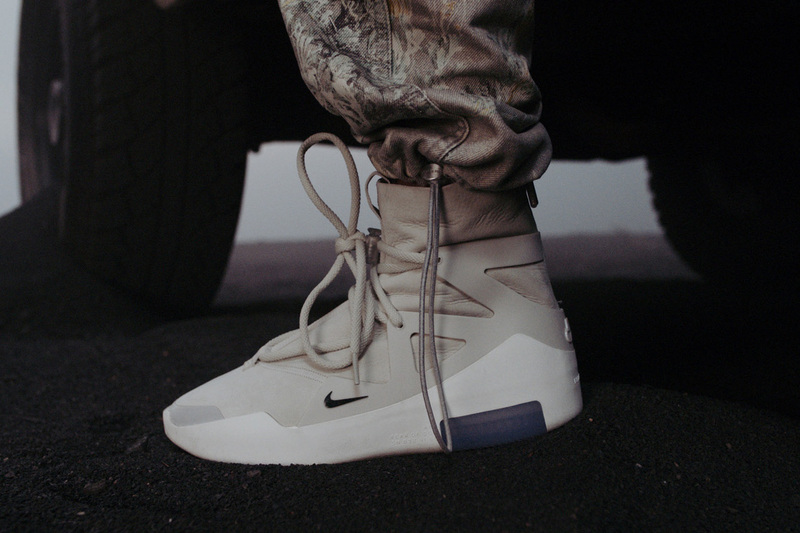 While the expansive reveal starred Jared Leto and tons of pieces to look forward to, its short video dropped a preview of a collaboration between Fear of God and Nike. Today we take a closer look at the upcoming release which features a mix of tan, white and translucent blue towards its sole unit. From the image provided, the classic Nike Air stamp is added onto the heel above an embossed Fear of God logo. A mini Swoosh appears in black towards the toe area as the heel’s caged-like overlay doubles as eyestays for its thick bungee cord-like lacing system. The end result is a mix between Jerry Lorenzo’s previous military-inspired footwear designs and Nike’s more futuristic offerings, like the MAG. According to sneaker leaker @py_rates the collaboration may retail for $395 USD and could release this October. Stay tuned for additional information regarding this model and let us know your thoughts. In related news, you can take a look at Fear of God’s recent ESSENTIALS campaign. Best of all, the map has classic ‘Black Ops’ locations including Nuketown. Walk into homeroom with some wild style. The third entry in his ongoing series. Debuted via a moody new visual. A new option to its vast amount of colorways. Guest spots from Croatian Amor, James K, Oxhy, and Puce Mary.